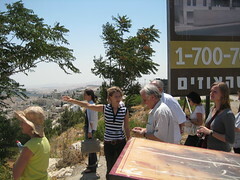 I spent Friday on a tour run by the Israeli Committee Against Home Demolitions (ICAHD). It was overwhelming, intense, and saddening. I'm glad I went. About ten of us were on the tour, which began at a community center called Daila on Shlomotzion HaMalkah street. Our guide was a woman named Sarah, whose Russian father came to Israel in the 70s and whose mother is a seventh-generation Jerusalemite whose family left in '49. After a brief presentation aimed at giving us common context, Sarah took us through East Jerusalem to see Jebel Muqaber and Abu Dis, the settlement blocks Nof Tzion (under construction) and Ma'ale Zeitim, a demolished home, the separation barrier in Abu Dis, and the settlement of Ma'ale Adumim. This is a long blog post for me -- about 4000 words. I want to tell you some of the things I learned, and I also want to write about what it felt like for me as an American Jew and a future rabbi to encounter all of this not as ideas or concepts but as physical places around me. Please read with an open mind and open heart. We began at Daila with a brief presentation about the history of this place and these stories. The tour, Sarah told us, would have three focal points: 1) settlement strategy (how a house with a family and garden can come to have sociopolitical implications), 2) Israeli narratives (how people come to be occupiers, and what stories they do and don't tell themselves), and 3) realities of Jerusalem, and what's unique about Jerusalem within the greater conflict. We looked at maps of the 1947 UN partition plan (which was accepted by the Jews but not by the Arabs, perhaps because at that point in time Jews owned about 6% of the land and the plan would have given them 55% -- including the coasts of both seas.) We talked about the policy -- then and now -- of creating "facts on the ground." The first settlement was Hebron, established in '68. Hebron is one of the Four Holy Cities where my tradition teaches that Jews have always lived -- well, "always" until the 1929 Hebron Massacre, when the British made the remaining Jewish population leave. Today there are 500,000 Israeli citizens in settlements in the Occupied Territories. ICAHD has created maps based on their work on the ground, and together we looked at some of those. Some of these settlement blocks are ideological; the rest are political or strategic. One of the settlements we would briefly visit, Ma'ale Adumim, is considered strategic because of how it nearly bisects the West Bank. The matrix of control is maintained through checkpoints. 80% of the checkpoints in Israel are within the Occupied Territories. There are 500 permanent checkpoints, some as big as airports; others are mobile, jeeps with soldiers in them. Jerusalem has a different status from the rest of the West Bank. 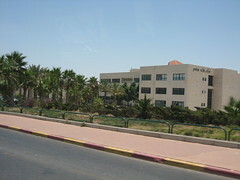 Per Israeli law, the West Bank is disputed or occupied territory (different groups use different terms there), but has never been annexed by Israel. But East Jerusalem was annexed in '67. East Jerusalem consisted of the Old City (about one square kilometer) and 69 square kilometers of other territory (including 28 Arab villages.) The annexation more than doubled the size of Jerusalem, and the demographics of the state of Israel changed radically as a result. In the rest of Israel, Arab Israelis are Israeli citizens. But in East Jerusalem and the West Bank, Arabs hold cards indicating residency, not citizenship. Israel offered citizenship to the East Jerusalem Arabs at the time of annexation and they refused. Sarah noted that at that time, dual citizenship wasn't an option; accepting Israeli citizenship meant giving up Jordanian citizenship, which would have meant becoming unable to visit extended families across the new border between Israel and Jordan. Although Arabs in East Jerusalem pay Israeli taxes, they cannot become Israeli citizens. We began on highway 1, the old "green line" border. We drove past the Old City and talked about the green line, which only existed for 19 years but is still a visible boundary in people's minds and hearts. We noted the good roads, wide sidewalks, curbs painted in bright colors, etc. Our first stop was Nof Tzion, a settlement block being built overlooking Jebel Muqaber, the Mount of Olives, and the Old City, all of which are considered part of Greater Jerusalem. (It was intriguing to me that Sarah referred to Jebel Muqaber as a Palestinian village, rather than an East Jerusalem neighborhood; I suspect the terminology reflects the lens through which she sees the story.) The first thing that amazed me is how close together everything is. In my imagination, a "settlement block" was something on a hill someplace semi-rural, not a tall apartment building overlooking a "village" which is just the little valley sandwiched tightly between two built-up places. Apartments in the Nof Tzion block cost upwards of $500,000 apiece. Those who choose to live in Nof Tzion, Sarah noted, look at this vista -- Old City, Mount of Olives -- and see Joshua, the prophets, King David... but they may not see the village that is directly beneath their building. Bear in mind, she added, that many settlers live in subsidized housing, and may not even understand why the world is so angry with them for their residential choices. The commonly-asserted figure is that 1/3 of settlers act out of political ideology, 1/3 of settlers act out of religious ideology, and 1/3 of settlers are poor and taking advantage of low-income housing provided to them by the Israeli government. We talked about the historification of the Bible (reading Tanakh as a historical text.) Here in Israel both the political sector and the religious sector use the Bible in this way. In my recent Biblical History class we talked a lot about reading Tanakh devotionally versus reading it historically, and about some of the places where it's problematic to treat the Bible as a historical document. (What's written in Tanakh doesn't always mesh with the historical/archaeological record. I'm much more interested in reading Tanakh as story and spiritual teaching than as history per se.) In the Diaspora, whether and how to read Torah as a historical document is an interesting intellectual and spiritual question. Here in Israel, readings which treat Torah as history have practical implications: those readings are used by the settlers to support their decision to live in the West Bank. People in Jebel Muqaber (and other Palestinian villages within Greater Jerusalem) pay taxes as high as those paid by West Jerusalem residents, but as soon as we turned past Nof Tzion the road quality degraded, the small fence keeping cars from running off the road broke down, there were no sidewalks and no trash cans (there is no trash collection) so in some places the roadway was littered with trash. Sarah told us that in villages like this one there is high poverty and high unemployment; the police don't police except for terror, so drug use is rampant; there are few jobs and inadequate schools. These villages (or neighborhoods -- they're so contiguous with everything else that it's hard for me to think of them as villages) have a very different feel than the places I'd seen in West Jerusalem. Signs here are not printed in Hebrew, only Arabic. Women wear long cloaks and headscarves, not the variations on "modest" dress that had become familiar to me in West Jerusalem. We saw another settlement block here, called Ma'ale Zeitim (Ascent of Olives or Olive Heights), built by an American billionaire named Moskovitch with proceeds from his bingo casinos in California. (The -- biased, but interesting -- Alternative Information Center has a piece about that: Gambling for Jerusalem.) Between Ma'ale Zeitim and Nof Tzion, the Palestinian village is boxed in and cannot expand. We drove along Jericho Road, which apparently used to be a commercial center. Now it is a wasteland, black plastic bags blowing like tumbleweeds. One argument for why commerce there has abruptly ended: the street runs right into the Separation Wall. I'd read plenty of things about the wall. I'd seen pictures. But I didn't understand -- not in a deep embodied way -- how it was going to affect me. A lump leapt into my throat and I felt sick. It is enormous: much higher than I had realized, topped with barbed wire. Standing beside it, I had the feeling that I was in prison. Since the wall was built, attacks against Israelis are at their lowest point since the 1980s. This is undeniable. But correlation is not causation, Sarah noted, and she suggested alternate explanations for the drop in attacks (e.g. maybe community leaders have finally figured out that suicide bombings are a terrible idea.) Though it's commonly asserted that the wall divides Jews from Arabs, like a quarreling couple who need time apart, in many places the wall divides Palestinians from other Palestinians. At the point where we stood, the wall doesn't separate Jews from Arabs, but divides Abu Dis from Abu Dis. Sarah told us a story about a Palestinian who really needed to get to West Jerusalem, but couldn't get permission to cross the wall, so he took a taxi to the place where the wall isn't yet completed and walked across and then took another taxi back to the heart of the city. The moral of that story: the wall doesn't actually stop determined individuals who want to get to West Jerusalem. 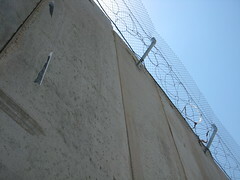 What the wall does do is stop social and economic life. Our next stop was the site of a home demolition. It is a pile of rubble with rebar sticking out of the shattered concrete. It is exactly as I had imagined from seeing photographs, but having it in front of me -- real and physical and three-dimensional -- I felt like I'd been kicked in the gut. The standard practice is for the bulldozers to show up in the morning. The family is given 15 or 30 minutes to clear out their things. Then foreign workers (usually Thais) may be sent in to drag the possessions out so the Israelis can't be accused of destroying property, and then the house is torn down. A home demolition comes with a bill to the family for the cost of the bulldozer and workers, along with a hefty fine for having built illegally in the first place. Within the context of Palestinian society, homes are where women have power over their own surroundings; if a family's house is destroyed and they have to move in with relatives, the woman of the house loses her sovereignty. The man of the house loses face in front of his family and community. The children are traumatized; many start wetting their beds and showing other signs of trauma, and one psychologist has done a study which shows that 55% of suicide bombers come from demolished homes. So why do people build illegally in the first place? It's been 41 years since the reunification of Jerusalem, and (as the New York Times notes in Israeli Riddle: Love Jerusalem, Hate Living There), no Palestinian neighborhoods/villages have been granted permits to build there during that time. Why not? Because there is no infrastructure. Until the Israeli government puts in infrastructure (roads, sewers, water, sidewalks), it's illegal to build. Corollary: as long as the government fails to put in those things, the building can't legally happen, and any building that does happen is illegal and can be destroyed without warning. Even if the infrastructure is there, applying for a building permit costs $5000. A wealthy developer can apply for that permit as part of a major building project (like the Nof Tzion settlement block) and the cost disappears into the cost of the overall project; for a Palestinian family, it's a prohibitive cost. There are 22,000 houses in East Jerusalem which have been built illegally. (That's according to ICAHD; the New York Times says 18,000. Either way, it's an awful lot of homes.) Each one is under demolition orders. 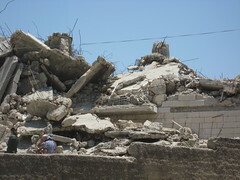 Home demolitions are illegal according to international and humanitarian law. (Learn more at ICAHD's House demolitions FAQ page.) 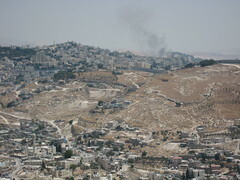 Sarah described the demolitions as a "violent expression of occupation." The ostensible reason for them is that they make Israel more secure, but the people whose homes are demolished are not known criminals. The only threat they pose is to Israeli demographics. ICAHD volunteers do build houses. When the houses are destroyed, as they usually are, the group rebuilds. 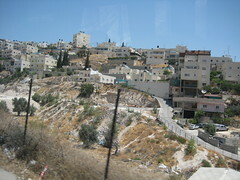 The last formal stop on our tour was Ma'ale Adumim, a wealthy suburb of Jerusalem. We went there to get a different (physical and emotional) perspective on the situation. 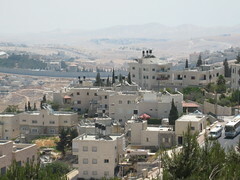 Ma'ale Adumim is a strategic settlement, because its location means that it almost cuts the West Bank in half. It is remarkably prosperous, with wide streets and comfortable curbs and lovely buildings with red roofs. But mostly what struck me about it was how green it is: greenery, strips of lawn, beautiful trees and planting in the street medians. Standing beneath an olive tree in a little park at the edge of Ma'ale Adumim, overlooking the highway and the rows of bushes marching down the hill fed by irrigation pipes, with the dry brown Judaean desert stretching out beyond our hill, the reality of the water situation knocked me flat. I grew up hearing rhetoric about "greening the desert," but I wonder now whether there's in fact enough water here to "green" anything. (There's some cutting-edge work being done in the Negev on this issue; for an overview read Advanced Agriculture as a Tool Against Desertification, and here's a link with some creative thoughts about permaculture work.) Anyway, it's clear that water -- who owns it, who has enough or doesn't have enough -- is a major piece of the story here. Many leftwing Zionists, Sarah noted, favor creating a Palestinian state, but they may favor this plan for demographic reasons. If the Palestinian state is inherently not viable -- because of lack of resources, because of the topography of the land and the way that the settlements break up West Bank territory -- is that really what the Left should be pushing for? What would be the implications of a one-state solution in which equal rights were given to all -- an outcome, in other words, in which Israel remained democratic but no longer had a Jewish majority? These are some of the things we talked about over lunch. I'm aware, of course, that this tour had a bias. Every tour of Jerusalem and environs has a bias, and a dominant narrative to which it subscribes. This narrative is not the one I'm used to hearing -- that's part of why I wanted to hear it. I was on trial a few years ago for standing in front of bulldozers which had come to demolish Palestinian homes not for any security reasons but because of the Catch-22 situation that if you are a Palestinian living in east Jerusalem or in the West Bank there is a purposeful, written, black-on-white policy that we want to keep a clear Jewish majority in Jerusalem and to do so we will expropriate Palestinian land to build Jewish neighborhoods on, and what we can't expropriate now we won't zone for building, so the Palestinians can't build until we can expropriate. You can see this in the minutes of city council meetings! So Palestinians -- having no way of legally building, without being informers or paying a bribe -- resort to building without a permit, and then their homes are demolished. But it's one thing to hear about a Catch-22 situation, and it's another thing to stand beside a pile of concrete and rebar that used to be someone's home and wonder how this situation obligates me, religiously and ethically, to act. I grew up believing that Israel was a "light unto the nations," that Israel necessarily hewed to a higher moral standard than everyone else. But these policies of home demolition and these settlements hemming in Palestinian villages feel to me the very opposite of righteousness, and that makes me heartsick. Are the Palestinians culpable for taking innocent lives and engaging in acts of terror? Of course. That's not even a question. But I don't feel culpable when those tragedies happen. As a Jew and a future rabbi, I do feel culpable -- or at least implicated -- when the homes of innocents are destroyed by my coreligionists in the state which was founded as an expression of my religious tradition's ideals. The work that we do is not fun. As an Israeli, a rabbi, a Jew, a Zionist, there is no great pleasure in dealing with the deepest and darkest corners of a country that I love. I would be a happier man if I did not know a fraction of what I know. But once you know you have a choice. You can hide your head in the sand. Or you can take the pain of knowing that things are happening that should not be happening, to spur you to do work of tikkun olam, to make the world a little bit better. In some ways I would be happier if my Israel summer were purely about the heady pleasure of learning and the heartfelt pleasure of praying in interesting new places. But if I'm here to develop a relationship with Israel, then I need to develop a relationship with all of Israel: the parts that fill me with joy, and the parts that fill me with anger and sorrow. That's what it means to be in honest relationship, and I believe I owe it to Israel to see even the shadow side of what happens here and to begin working toward figuring out what I can do to make things better than they are now. 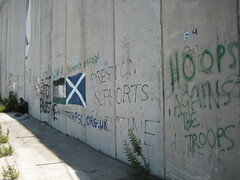 Technorati tags: Israel, Palestine, ICAHD.